Bike Commuting - One significant advantage of traveling by bike is knowing how long it takes to get to your destination. It may take longer to ride than some other options but at least you can plan accordingly. Most Fairfax commuters travel long distances so it may not be feasible to complete your full commute by bike. However, bikes are a great way to connect non-Metro travel options. 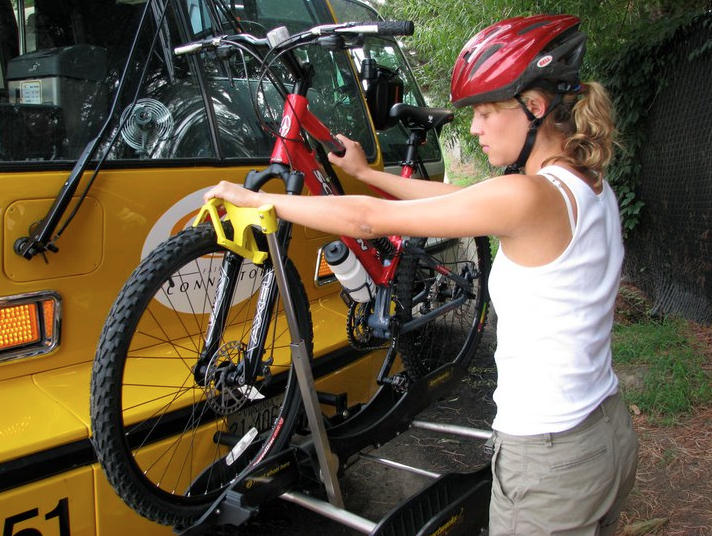 You could ride to the bus stop, put your bike on the rack on the front of the bus, then reverse the process at the other end of your bus ride. Folding bikes can be taken on Metro during all operating hours and they give you yet another option during unscheduled delays. Full-size bikes cannot be taken on trains during peak hours (7-10 am and 4-7 pm). See WMATA's Bikes and Metro page. Fairfax Connector and Metro buses have bike racks, so combining bikes and buses greatly extends your trip. Use WMATA's Trip Planner to learn about Metro bus and train options (including Fairfax Connector buses) and to estimate travel times. We've been told that Trip Planner travel times will include SafeTrack delays. Use Google Maps bike directions and Fairfax County's interactive bike map to find possible bike routes. If you'd like more info on strategies for bike commuting, including advice on equipment, clothing, and finding the best routes, contact FABB. Capital Bikeshare - Bikeshare bikes are available at many of the Metro stations where single-tracking will occur. See the CaBi Station map for details. You must be a CaBi member to check out a bike. Several membership options are available: 24-hour ($8), 3-day ($17), 30-day ($28), or Annual ($85). All rides lasting under 30 minutes are free. See the CaBi How it Works page for details. Update - June 2 - WABA recently published their page How to Bike During SafeTrack. WABA is also looking for volunteers to support biking during SafeTrack. Arlington County is installing a Bikeshare station at the East Falls Church Metrorail station, and capacity will be added to the Bikeshare stations at Ballston and Rosslyn stations. Most Metrorail stations have a Bikeshare stand nearby. One-day, three-day, monthly, and yearly memberships are available. Consider bicycling to Ballston, Virginia Square, and other stations to the east, where more trains will be running and provide a good chance of getting space on board. Added bicycle parking will be available at Ballston. For customers at McLean, Vienna, West Falls Church, and East Falls Church, consider taking the W&OD and Custis Trails to Ballston station. The W&OD trail is within a half-mile of those stations, and leads to Ballston. The route to the station will be signed clearly. WABA has posted bike-friendly routes to and from these stations to the trail. Customers who normally bike to Wiehle-Reston East station should consider riding and parking at the North Reston and Herndon-Monroe Park & Rides, where enhanced express bus service will be available. Your support is needed for Fairfax County's proposal to create bike lanes on Southrun Road. The project will help connect existing bike facilities on Pohick and Silverbrook Roads near the Cross County Trail. Please send a short message using the comment form on the right side of the project page. It should only take a minute or two to send a supportive comment. Are you familiar with bike conditions on Little River Turnpike inside the Beltway? The 2014 Transportation Priorities Plan allocated $7.5 million to "Add bike lanes, wide curb lanes, bike shoulders to complete network gaps" along the roadway. The county is conducting the Little River Turnpike Bicycle Study to determine what improvements are needed. Please consider adding your comments to the Little River Turnpike Bicycle Corridor Interactive Map. McWhorter Place is located south of Route 236 in Annandale, just inside the Beltway. It is an important bicycle route with a very low speed limit. 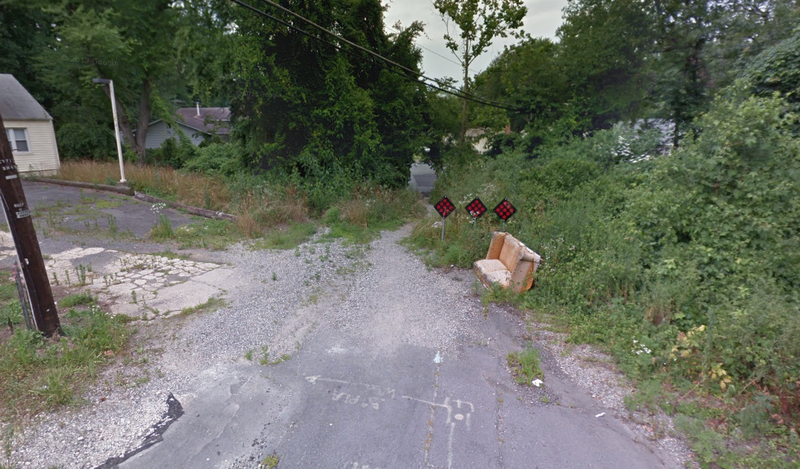 There is a missing connection between two segments of the street that is currently a goat trail used by bicyclists and pedestrians. 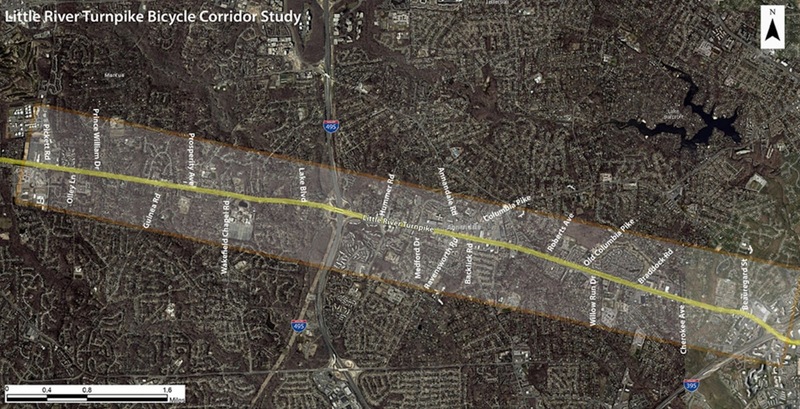 Fairfax County plans to build a new trail connecting the two street segments. Bike lanes are planned on the eastern section of McWhorter Place and John Marr Dr, another reason this is an important connection. Cyclists in the this area are encouraged to support this project at the meeting on Wed.
Mason District Supervisor Penny Gross and the Fairfax County Department of Transportation (FCDOT) will host a community meeting on the McWhorter Place Trail Project on Wednesday, May 25, 2016, in the cafeteria of Annandale High School, 4700 Medford Drive, Annandale. The meeting will feature an Open House at 7 p.m., to view a display of proposed improvements, followed by a short presentation at 7:30 p.m., with time for questions and answers. FCDOT ensures nondiscrimination in all programs and activities in accordance with Title VI of the Civil Rights Act of 1964 and the Americans with Disabilities Act (ADA). If you need this information in an alternate format, contact FCDOT at 703-877-5600, TTY 711. Requests for assistance must be received at least 7 business days in advance of an event. It is exciting that current plans for I-66 Outside the Beltway include the parallel trail and bike and pedestrian connections on all rebuilt bridges, but we want to make sure it becomes a reality! 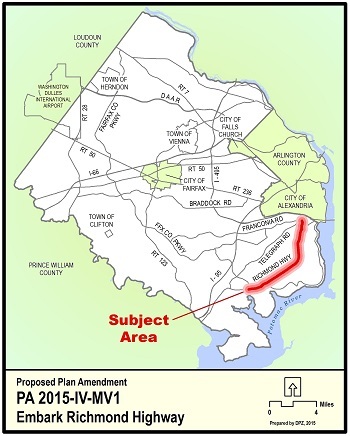 VDOT's draft RFP includes the Technical Requirements and Comprehensive Agreement, which will set the terms of the I-66 contract with the private-sector partner. Searching the documents for "bicycle" will quickly direct you to key sections. While the parallel trail and bridge facilities are discussed in the technical requirements, the comprehensive agreement currently does not mention the bicycle facilities. Please let VDOT know that you support the I-66 bicycle plan and urge them to fully include it in the comprehensive agreement. The hearings will provide opportunity for public feedback. Comments can also be submitted until June 10th. Please direct them to Ms. Susan Shaw, Megaprojects Director, by email to Transform66@VDOT.Virginia.gov or mail to VDOT Northern Virginia District Office, 4975 Alliance Drive, Fairfax, VA 22030. Reference "Transform 66 Outside the Beltway" in the subject line. During Bike Month 2015 Deloitte released a report on improving transportation options and bike commuting that featured Fairfax County. The study, Smart Mobility: Reducing Congestion and Fostering Faster, Greener and Cheaper Transportation Options (Deloitte University Press, 2015), is available here and, after a year, the study is worth a second look. Graphic courtesy of Smart Mobility. 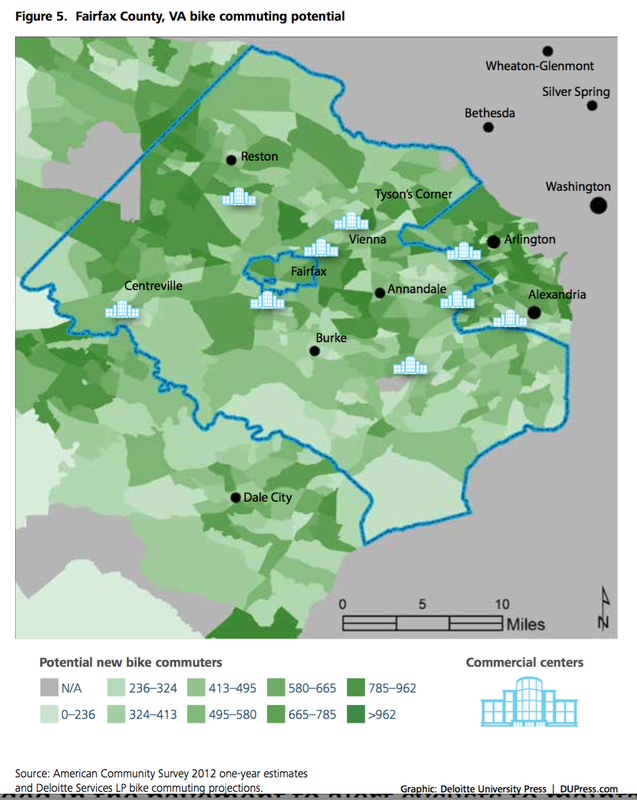 One of the study’s findings was that bike commuting’s potential value is not evenly distributed inside each metro area across the United States, and it cites Fairfax County as a prominent example of such unmet potential. The greatest prospective benefits are likely to be in core urban centers and, perhaps surprisingly, in suburban neighborhoods near smaller commercial centers. According to the study, areas with higher concentrations of potential bike commuters in Fairfax cluster around suburban “edge cities” containing commercial centers such as Reston, Tysons, Herndon, Manassas, and Woodbridge. The identification of Tysons as one of these “hot spots” for potential bike commuting was described as possibly counterintuitive because the area used to be a national symbol of car-friendly and congested development. 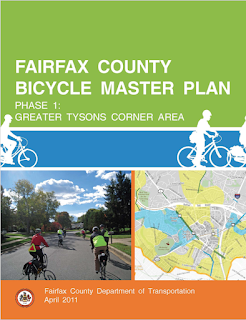 But, the study notes, “bikeability” forms a major part of Tysons’ long-term development plan. 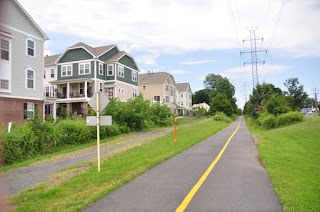 Meanwhile, medium-density suburban neighborhoods located one to three miles away from thriving commercial developments, such as Reston Town Center, offer surprisingly good opportunities for increasing bike ridership to sustain its economic growth and attract younger residents. This is especially true now that the Metro Silver Line has opened. The progress on improving “bikeability” in these parts of Fairfax County, however, has been mixed. 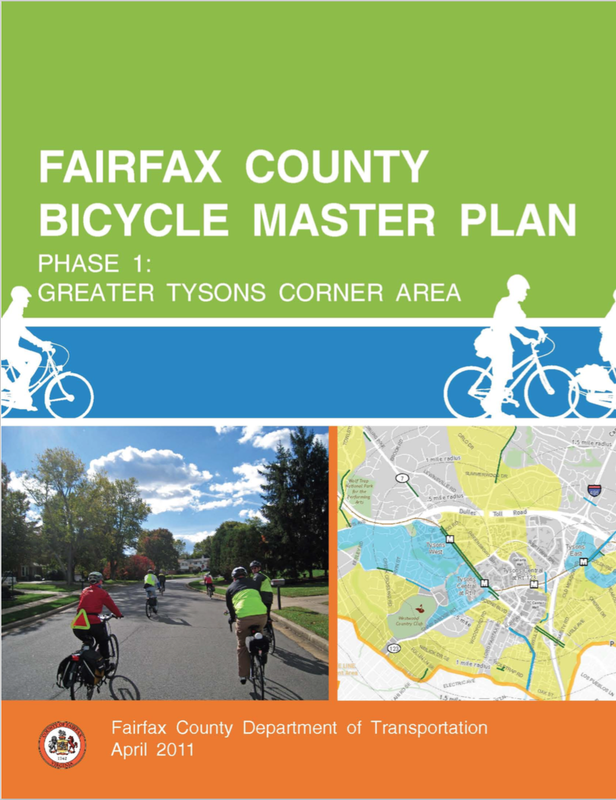 On the positive side, during the past year Fairfax County has worked with the Virginia Department of Transportation to create more than 2 miles of new bike lanes in Tysons and more new lanes are coming this summer in other areas of the county. Earlier this year, the Board of Supervisors approved $1.7 million for bike sharing and is working in a private-public partnership with Tysons Partnership to bring Bikeshare stations to Reston, Tysons, and other areas. Install signs for 16 bicycle routes to the four Tysons Silver Line Stations and for an interim alternative route (not using VA Route 123) between Vienna and McLean. Provide a volunteer Bicycle-to-Transit Ambassadors program at Metro stations. Launch a bicycle commuting marketing campaign highlighting to prospective new bicycle commuters the time savings current Tysons bicycle commuters are experiencing as compared to motor vehicle travel. Establish a Bike-Friendly Employer program with corporate members. Achieve an 80 percent of capacity bike parking rate at the Tysons Metro stations. FABB members interested in a fresh take on the reasons why cycling enriches and strengthens their mind, body, and spirit should plan on attending a book launch party on Wednesday, May 18, at One More Page Books. 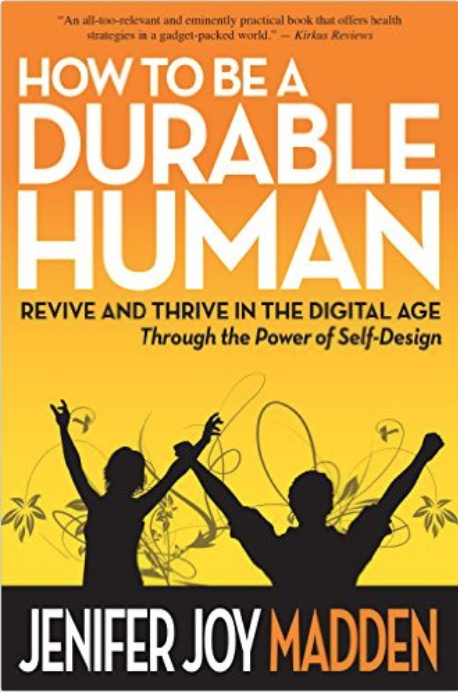 At the event, FABB member and Northern Virginia community leader Jenifer Joy Madden will be discussing her new book How to Be a Durable Human: Revive and Thrive in the Digital Age through the Power of Self-Design. In what is described as a handbook for being a human in the 21st century, readers learn to refresh in themselves what has been inadvertently trammeled by their close association with smart phones and other devices of personal technology. Jenifer describes how a cycling crash on the W&OD trail prompted her to think about distractions in her life and then develop simple ways to reduce time spent with gadgets and add more activity to each day to promote better health and sleep, especially for children. Among the stories in her book, Jenifer explores FABB President Jeff Anderson’s efforts to start a bike train for children biking to school and highlights the suburban multi-modal transportation advocacy of local cycling mover and shaker Finnouala Quinn. Jenifer is a multi-media journalist, digital media professor, and parent of three who lives in the Tysons, Virginia, area, and – as an appointed county transportation commissioner – she literally and figuratively builds bridges to greater well-being. Everyone is welcome. One More Page Books is easily accessible by bike and is just off the W&OD Trail at 2200 N Westmoreland Street near the East Falls Church Metro. Celebrate bike month with three exciting bike events in May! Bike to Work Day, Tour de Fat, and DC Bike Ride are all falling on the same weekend of May 20-22 creating a fun-filled spring weekend to celebrate bicycling. Events kick off Friday, May 20 with Bike to Work Day, a celebration of biking as a clean, fun, and healthy way to get to work. This year Fairfax is hosting 14 Bike to Work Day pit stops and FABB will be at most of them greeting riders and talking about local bike advocacy efforts. Join the festivities and bike to work. Register today! 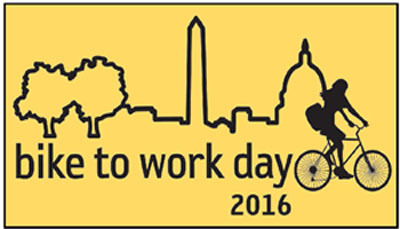 Participants receive a free 2016 Bike to Work Day T-shirt. FABB still needs volunteers at a couple of pit stops. If you can help, please sign up on Volunteer Spot. On Saturday, May 21, the Tour de Fat bicycle festival will be at Yards Park (next to Nationals Stadium). 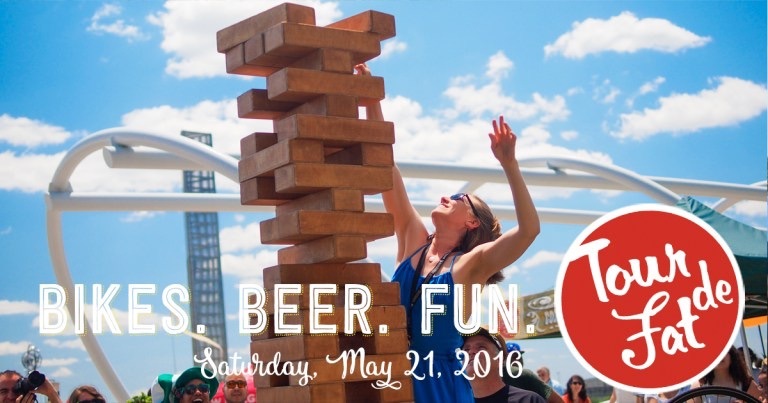 The all-day bike party offers tasty beers along with games, art, and music by the river. It is sponsored by New Belgium Brewery and helps raise funds for bike advocacy in the DC area. FABB still needs volunteers to help check IDs. Sign up to volunteer today! Enter 'FABB' as the password to be directed to our volunteer page. Then Sunday, the inaugural DC Bike Ride will open up 17 miles of D.C. streets for a car-free ride through our nation’s capital. See the sites by bike at your own pace. Then enjoy the Finish Festival with musical performances by Questlove and White Ford Bronco. Join the ride today at DCBikeRide. Receive a $10 discount by entering user code ‘FABB’ when registering. Online registration ends May 18. It’s official! FABB received its 501(c)3 nonprofit status earlier this year. We need your help to start us off on the right foot. Will you make a donation to FABB today? FABB is already off and running in 2016. We’ve held community meetings in the Mount Vernon and Mason districts meeting new cyclists and learning about the most pressing local needs, advocated for new bike lanes as part of VDOT’s summer repaving program and are pushing for a parallel trail along I-66 outside the Beltway. FABB is developing an advocacy leadership workshop that will train and empower a community of advocates and grow our movement for a bike-friendly Fairfax. We also plan to update our website to help provide a fresh public interface for local bike news and reach new supporters. Your donation today will help support these initiatives. Bike facilities are included in current plans for I-66 Outside the Beltway, across the rebuilt bridges over I-66 and a new parallel trail that would be an extension of the Custis Trail that is located inside the Beltway. VDOT is planning public meetings in May to present the complete set of draft Request for Proposals (RFP) documents for the project. Cyclists are asked to attend one of the meetings and support bike facilities as part of the project. See the FABB I-66 Info Page for supporting documents. Last week students, teachers, and supporters of more active lifestyles for children participated in this year’s Bike to School Day in Fairfax County. On May 4th, more than 60 Fairfax County elementary and middle schools participated in the event. Kids on scooters, skateboards, and on their own two feet braved the overcast skies to join their fellow students in promoting fitness as part of their daily routine. Fairfax County Public Schools encouraged increased ridership by handing out backpack tags to participants at the elementary schools and cinch sacks at the middle schools. The Fairfax County Police Department also lent its support throughout the county. FCPD bike patrol officers led three bike trains to WolfTrap Elementary in Hunter Mill District. The FCPD also assisted at Hunter Woods and Sunrise Valley Elementary Schools in Reston, escorting kids and ensuring their safety. Chesterbrook Elementary in McLean had more than 200 students plus family and other community members join in the fun. Check out this great video Chesterbrook’s Bike to School event here. All eight of Reston’s elementary schools participated with initial reports of 116 riders at Armstrong, 46 at Dogwood, 40 at Forest Edge, 110 at Lake Anne and 70 at Sunrise Valley. Aldrin reported a total of 118 bikers and walkers. At Dogwood Elementary, riders received assistance from the Reston Bike Club with minor maintenance and helmet fit. The club also provided helmets to those without them. Cunningham Park had twice as many bicyclists than on a normal day and Louise Archer’s cyclists opted to walk with rain threatening. Join FABB in Springfield to talk bicycling and learn about upcoming county bike plans in the Springfield area. This will be our third district meeting as FABB continues to meet around the county in an effort to hear from local residents about their bicycling needs. The meeting will be held at 7:30pm, May 18, at the West Springfield Government Center Community Room. The following month, FABB will be meeting in the Lee District at the Richard Byrd Library in Springfield on June 15th. Check out a recent FABB blog post Future FABB Meetings Around the County for more information about our district meetings and the upcoming schedule. The proposed second phase W&OD Trail lighting project in Herndon will be presented Thursday, May 12, at 7 pm at Herndon Council Chambers (765 Lynn Street, Herndon). In addition to hearing about the project, attendees will have the opportunity to ask questions and offer feedback on the project. Under the proposal, another 2,400 feet of the 2.4 mile section of the trail in the town will be lit. The 22 new light posts will cover the section of the trail between Ferndale Avenue and Crestview Drive. The Fairfax County Department of Transportation is holding a public meeting to discuss ways to improve bicycling along the Little River Turnpike. The meeting will be held at 6:30pm, May 17, at Annandale Terrace E.S. in Annandale. FCDOT is seeking public input as part of its bicycle access study of the Little River Turnpike corridor from Fairfax to Alexandria. For more information on the study check out FCDOT's website. FABB was at Fairfax County’s premier spring event celebrating the environment. SpringFest was held on April 30 at the Workhouse in Lorton and FABB was there together with DC Bike Ride representatives. We discussed Safe Routes to Schools with interested parents, promoted Bike to Work Day and entertained hundreds of youngsters with prizes and a game designed to spark interest in bicycling. 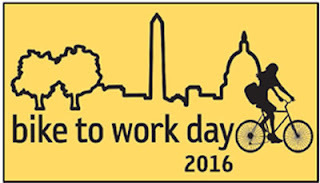 May 20 - Bike to Work Day - Registration is open for the 14 events in Fairfax County. May 21 - Tour de Fat - Join FABB at this fun bike party in DC. To volunteer contact us. May 22 - DC Bike Ride - Ride on car-free DC streets, use code “FABB” for $10 discount! FABB wants to alert members and other interested riders and citizens to a community meeting hosted by the Fairfax County Department of Transportation on Tuesday, May 17, to discuss ways to improve bicycling along Little River Turnpike from the City of Fairfax to Alexandria. The goal of this public forum is to gather information from local residents on existing conditions, problem locations, and short- and long-term improvements that will make bicycling viable in this corridor. The meeting will be held at Annandale Terrace Elementary School, 7604 Herald St., Annandale, at 6:30 pm. For more information on the project, please visit Fairfax County Government webpage here. Help FABB Kick Into Gear! Make a Donation – FABB is developing an advocacy leadership workshop that will train and empower a community of advocates and grow our movement for a bike-friendly Fairfax. We also plan to update our website to help provide a fresh public interface for local bike news and reach new supporters. Your donation here will help make these plans a reality. Volunteer -- As an all-volunteer organization, FABB relies on supporters like you to donate their time to improve bicycling in our neighborhoods and around the County. Volunteers can provide outreach at local events, advocate for better bicycling, and provide administrative support and guidance. Visit our volunteer webpage to learn about specific opportunities and get in touch with us. We’ll find the right fit for you. Holding district meetings in Mount Vernon and Mason Districts meeting new cyclists and learning about the most pressing local needs. Advocating for new bike lanes in the Mason and Braddock Districts as part of VDOT’s summer repaving program. Leading the charge for a parallel trail along I-66 outside the Beltway. Utilizing short videos like the recently released bike parking video to advance a bike-friendly Fairfax. Will you help us continue this progress with a contribution to FABB today? Together with your support and participation, we can continue to do great things in 2016. W&OD Trail near Van Buren Street. Herndon Parks and Recreation and the engineering firm Johnson, Mirmiran & Thompson will make a presentation on the proposed second phase W&OD Trail lighting project on Thursday, May 12, at 7 pm at Herndon Council Chambers, 765 Lynn Street, Herndon. In addition to hearing about the project, attendees will have the opportunity to ask questions and offer comments on the project. 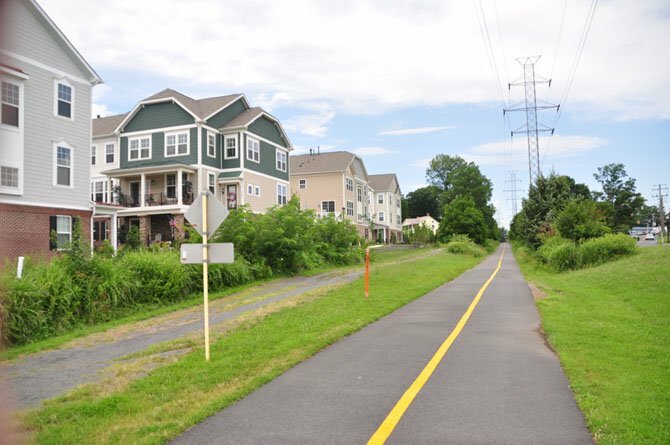 The proposed second phase will add to the first phase’s installation in 2014 of light posts to illuminate 3,800 feet of the W&OD Trail in Herndon between Van Buren Street and Ferndale Avenue. Under the proposal, another 2,400 feet of the 2.4 mile section of the trail in the town will be lit. The 22 new light posts will cover the section of the trail between Ferndale Avenue and Crestview Drive. For more information, call 703-435-68--, extension x2123 or email parksandrec@herndon-va.gov. This past week students, teachers, and supporters of more active lifestyles for children participated in this year’s Bike to School Day in Fairfax County. On May 4th, more than 60 Fairfax County elementary and middle schools participated in the event. Kids on scooters, skate boards, and on the own two feet also braved the overcast skies to join their fellow students in promoting fitness as part of their daily routine. Fairfax County Public Schools encouraged increased ridership by handing out backpack tags to participants at the elementary schools and cinch sacks at the middle schools. The Fairfax County Police Department also lent its support throughout the country. FCPD bike patrol officers led three bike trains to Wolf Trap Elementary in Hunter Mill District. The FCPD also assisted at Hunter Woods and Sunrise Valley Elementary Schools in Reston, escorting kids and ensuring their safety. Chesterbrook Elementary in McLean had more than 200 students plus family and other community members join in the fun. Check out the video of the Chesterbrook event here. All eight of Reston’s elementary schools participated with initial reports of 116 riders at Armstron, 46 at Dogwood, 40 at Forest Edge, 110 at Lake Anne and 70 at Sunrise Valley. Aldrin reported a total of 118 bikers and walkers. At Dogwood Elementary, riders received assistance from the Reston Bike Club with minor maintenance and helmet fit. The club also provide helmets to those without them. Please share your Bike to School Day stories using the comments section below. Fairfax County’s events were among nearly 1,000 local events in 49 states and the District of Columbia to encourage children to safely bicycle or walk to school. This was the fifth National Bike to School Day, which first took place on May 9, 2012. National Bike to School Day provides an opportunity for schools across the country to join together to celebrate and to build off the energy of National Bike Month. There are only two weeks to go until FABB volunteers help make this year’s Tour de Fat the best ever. Tour de Fat is New Belgium Brewing’s traveling celebration of all things bicycle, honoring humankind’s greatest invention. So, please plan on joining thousands of Metro area bicyclists at Yard’s Park, 355 Water St SE, on Saturday, May 21, 2016, for a costumed bike parade and musical acts, peppered with fun like dance contests, a Slow Ride competition, and other interactive events. Also, everyone is invited to join the New Belgium Brewing Company, WABA, and Tour de Fat volunteers for a TdF Promotion Party and kickoff for WABA's Really Big Bike Weekend. The party will be held on Thursday, May 18, 2016, at 6:00pm at the Dew Drop Inn, 2801 8th Street NE, in DC. RSVP for the promo party on Facebook here. FABB still needs a few more volunteers. Please help and sign up here for a morning or afternoon shift. Enter "FABB" as the password and you will see "ID & Wristbands," which allows you to select a morning (10am-1:30pm) or afternoon (1-5pm) shift. FABB is encouraging members and other bicyclists in southern Fairfax County to attend the upcoming community meeting on the plans and work currently underway on the Embark Richmond Highway project. The meeting is scheduled for Monday, May 9, 2016, from 7 to 9 p.m., at Walt Whitman Middle School, 2500 Parkers Lane, Alexandria. Embark Richmond Highway supports Fairfax County’s long term planning goals of expanding transit service, improving the county’s multimodal transportation system for mixed use areas and building more dense, mixed-use, transit-oriented developments that attract more residents and businesses, and create more job and tax revenues. A presentation on the project and remarks by Lee District Supervisor Jeff McKay and Mount Vernon District Supervisor Dan Storck will be followed by an open house in the cafeteria where the public will be able to talk one-on-one with county staff representatives who are leading various aspects of the project. For more information on the May 9 community meeting, visit the Embark Richmond Highway web page or contact Fairfax County Department of Planning and Zoning at (703) 324-1380, TTY 711.